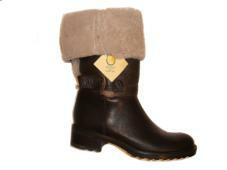 Exuisite and comfortable brown boot by Manas of Italy with shearling shaft which may be worn up, revealing sheepskin fleece on seems, or folded over to show sheepskin cuff. Half zip to ease putting on and buckle strap detail. Approximately 14" at full height.